TYST TERRITORIUM: Sju reportage om Västsahara (Atlas 2013). Not translated. 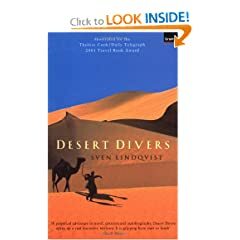 In this book we follow two Swedish journalists, Fredrik Laurin and Lars Schmidt, on their travel through Western Sahara and the camps in Algeria. It is written like a journal but also with lots of facts on the conflict between Morocco and Polisario/SADR, as well as thoughts on international politics and business regarding Morocco and Western Sahara (with an emphasis on Swedish politics and business, e.g. Swedish fishermen outside the coast of Western Sahara). The personal thoughts and views of Laurin and Schmidt, their meetings with saharawi activists and the printed colour pictures from the Western Sahara camps and desert, are alone worth your time and money. This book is not yet translated (to English or other languages). So if you know the Swedish language and have some time off: Here´s some good work for you! This great site "was established by the poet Sarah Maguire in 2004" and they "translate leading contemporary poets from Africa, Asia and Latin America, all of whom are highly respected in their own culture." For every poet there's a short biography, original poems and translations into English. Highly recommended. written many poems about her people's struggle for independence. and some older ones-simply click the "fiction" page (above). 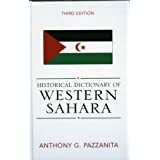 Historical Dictionary of Western Sahara by Anthony G. Pazzanita. For review, how to get it etc., click the academic page above. "The Swedish writer is furious, learned, curious, sad, witty..."
comment, see the travel page above. sjøvik and green reefers break the "business know-how"
The business know-how published by the Foreign Ministry? But generally they're OK, right? Two days ago the saharawi protest camp outside El Aaíun, was attacked and destroyed by moroccan security forces. According to various news agencies, at least one saharawi was killed. (The total number is still not known.) Many are injured. For more information, see "google-news" below or www.vest-sahara.no (which has videos showing the camp before, during and after the attack of the moroccan forces. Texts in Norwegian, English, Spanish and French. See link at this page). It is actually out of print, but you can order photocopies at amazon.com. Two of the activists mentioned below (Dahane and Tamek) are currently imprisoned in Morocco. They have been waiting for over one year for their trials to begin. Book description from amazon.com: "Purchase includes free access to book updates online and a free trial membership in the publisher's book club where you can select from more than a million books without charge. 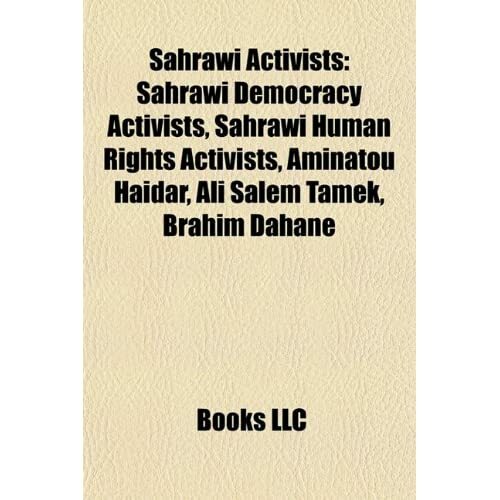 Chapters: Sahrawi Democracy Activists, Sahrawi Human Rights Activists, Aminatou Haidar, Ali Salem Tamek, Brahim Dahane, Mohammed Daddach, Muhammad Bassiri, Mohamed Elmoutaoikil. Excerpt: Aminatou Haidar (born July 24, 1966), sometimes known as Aminatu or Aminetu, is a Sahrawi human rights-defender and political activist. She is a leading activist for the independence of Western Sahara. She is sometimes called the "Saharawi Gandhi" for her nonviolent protests, including hunger strikes, in the support of the independence of Western Sahara.. She is the president of the Collective Of Sahrawi Human Rights Defenders (CODESA). Aminatou was born in 1966 in Akka, Morocco, her grandmother's town, although she lived her childhood in her parents town, Tan-Tan (former Western Sahara). She lives in El Aaiún in Western Sahara, with two children (Muhammad and Hayat), is divorced, and holds a baccalaureate in modern literature. She recognizes herself as a supporter of Polisario. In November 21, 1987, she passed to be one of the hundreds of Sahrawis disappeared in Moroccan prisons. After years of tortures."